The article presents some valid concerns about the motivations of the pharmaceutical industry, financial incentives for doctors to over-prescribe drugs, and about the DSM V’s expansion of definitions such that almost anyone would qualify as having a mental illness. I have shared some of those concerns around the “epidemic” of ADHD in a previous blog. For the record, however, I think this article goes overboard, and presents no remedies, just a litany of complaints. “He and his colleagues will fail, of course. Science always does.” Ian Brown says. Oh? I think science did a pretty good job with the germ theory, the polio vaccine and insulin for diabetes, but maybe I’m not picky enough. The article goes on to say that every subsequent version of the DSM has been controversial. Ok, but what’s new about rejection of new explanations for old problems? Should we simply stop developing theories, trying them out, and updating them when we have better information for fear of being wrong in the long run? Isn’t that how we learn? Has our unhappiness increased (and I’ve yet to meet someone who would describe their unhappiness as “mere” or themselves as eccentric) and/or are we more mentally disturbed today than we were nearly sixty years ago when DSM I made its first appearance? It’s hard to say. The world is a very different place, but I would venture to suggest that while human nature hasn’t changed much since 1952, we’ve had exponential growth in scientific knowledge, particularly around the brain, and with it, unprecedented access to that information through advances in technology. We simply know more, and are able to share it with unprecedented speed. Mental illness was a taboo and little understood subject sixty years ago, so it stands to reason that as knowledge has increased, the manual which sets out the details of its manifestations has also swelled. But is there something else going on? Are we more unhappy than we were before? One thing is apparent: we have far greater access to images to inform us how “the other half lives”, and with our status-seeking orientation, increased opportunity for comparisons that leave us feeling inadequate. People may not have changed, but my sense is that their expectations about what life should hold have shifted significantly. Research by Professor Wolfram Schultz, of Cambridge University in England into the links between dopamine, desire and disappointment may shed some light on how greater expectations may be contributing to greater unhappiness, as outlined in David Rock’s article “(Not So Great) Expectations.” When we are expecting something, and don’t get it, the dopamine levels in our brains drop sharply, causing something akin to intense physical pain. Conversely, dopamine levels rise when we are anticipating something pleasurable. It’s why we like to have something to look forward to, like a planned vacation or an upcoming evening with friends. Is the secret to keep our expectations low so we won’t be disappointed? The data would suggest that learning to manage expectations through additional awareness might be more fruitful, and that includes improving our focus on what is already going right, for one of the strongest positive indicators for happiness is gratitude. At the same time, I fear we’ve had a commensurate shrinkage in our expectations about the level of effort we should have to expend to bring about that better life. Left to our own devices, we prefer things to be quick and easy, including our penchant for fast food and our distaste for exercise, which is contributing to national obesity and its related illnesses, both physical and mental. There is very strong evidence to suggest that exercise is as, if not more, effective than medication in treating depression, such as the study at Duke University, yet antidepressants remain very popular because they require less effort. Well, like growing old, happiness is not for sissies. 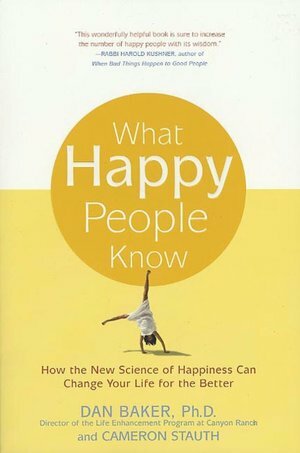 It’s work, but for most of us, it’s achievable, as Dan Baker, psychologist and former director of the Life Enhancement Program at Canyon Ranch so eloquently outlines in What Happy People Know. He describes happiness traps to be avoided, like trying to buy happiness or find it through pleasure. He believes that people can teach themselves to be happy through the use of six happiness tools, namely appreciation, choice, personal power, leading with strengths, language and stories, and multidimensional living. As our knowledge of unhappiness and mental illness has increased, so has our understanding of the underpinnings of happiness, although that is not the focus of the DSM, which serves as a diagnostic reference tool for psychologists of the “find what’s wrong and fix it” school of thought. To understand flourishing, we must turn to the DSM’s polar opposite, Character Strengths and Virtues, A Handbook and Classification. When Drs. Seligman and Peterson were in throes of writing the book, they referred to it affectionately as the “un-DSM”, and their goal was to identify and classify what was right with people, rather than what was wrong, which is the foundation of the Positive Psychology movement. Psychological health is not merely the absence of disease, but at its best, is characterized as thriving. Both the DSM and the “un-DSM” set out to provide a classification scheme so that psychologists can identify conditions, of distress or flourishing, in a reasonably productive and consistent manner. Classification helps recognize basic elements to establish a protocol for evaluating data. Is it perfect? Not by a long shot, but then things rarely are, are they? Humans are complicated, whether they are presenting or evaluating data. Rather than bashing the DSM V, let’s each of us take responsibility for our own happiness and mental well-being to the best of our ability through proper diet, sufficient exercise and a focus on optimism and gratitude. If are unfortunate enough to number among the legion who did not win the cortical lottery and suffer from a mental disorder that requires treatment, let us thank our lucky stars that we have a branch of medicine and devoted practitioners to help us overcome those difficulties. Let us give further thanks that we were born in a time that allows us to get the help we need, rather experience some of the ghastly outcomes suffered by our forebears. It’s all too easy to criticize, but it takes work to be constructive and optimistic. Happiness is not for sissies.